How critical is the problem of overpopulation in today’s world? During the sixties the catastrophe theory came into fashion: we were warned that if we didn’t do something about the expanding human race, each of us would soon be confined to one square yard of earth. Then inthe seventies the issue suddenly dropped from public consciousness–worn out, perhaps, by too much exposure. Yet the clock still ticks. The population bomb has by no means been defused, as the world birth rate continues to climb. Where do things stand with this ominous global dilemma? • Has the population problem improved? • What are the consequences of world population growth on natural resources, food supply and environment? • How are labor, migration, and international trade affected by the rising birth rate? • How does overpopulation affect the family? Health care? Senior citizens? Biomedical ethics? • What are the current efforts to control population? How effective are they? This book is long overdue. 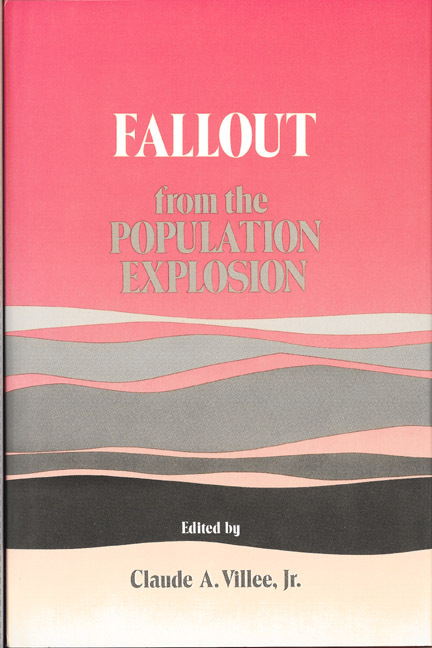 Compiled with both layman and scholar in mind, Fallout from the Population Explosion is for anyone who wants to know the truth about overpopulation–what it means for us and for the future of humankind. Professor CLAUDE A. VILLEE, JR. is Andelot Professor of Biological Chemistry at HarvardMedical School. Having served as consultant for the Ford Foundation, the National Sciences Foundation, and the National Institutes of Health, he played a key role in establishing the Laboratory of Human Reproduction and Reproductive Biology at Harvard Medical School. Vice President of the International Foundation for Biochemical Endocrinology, Dr. Villee has published a variety of books and monographs. These include eight successive editions of Biology, six editions of General Zoology, two editions of Biological Principles and Processes, and three editions of Human Reproduction. In addition he has edited many other volumes and published numerous papers in scientific journals.